I am very honored to have collaborated on this post with John Riley, an amazing educator and friend. John and I are likeminded in many areas, but our most common link is passion regarding what is best for kids (BFK), and the power of social media. We hope you will benefit from our collective thoughts, and share this initiative with us! The power of social media is priceless. It’ a crazy piece of the puzzle that can connect two educators in completely different states and inspire them to collaborate on blog. What you are about to read is just that. Bethany will share some background about how we got connected and introduce the concept of placing content second. I (John) will finish up with some scenarios and how to in order to help implement this change. Becoming a connected educator is one of the most important decisions I have ever made. Three summers ago, I decided to enter the Twitter world in order to keep up with my son’s activity. Little did I know that a whole new world of professional learning was waiting on me. One of the first people I connected with that fall was John Riley, an educator from Ohio. We connected in No Box Thinking Chat, and I quickly knew we were like minded. Since then we have learned from each other and grown in our profession. I consider him a friend even though we have never had the honor of meeting face to face.I cherish the relationships I have formed and the empowerment I have gained from my connections. There are so many aspects of education that spark my passion, but the most important belief I possess is the fact that we must love kids first and foremost. The very first meeting between myself and a child is one of my most cherished moments, for it is the moment when I “get” to make that individual a priority. I have an opportunity to show appreciation for who that child is, which is not a “student”, but a real person who deserves to be noticed. Kids have to feel that initial connection early, because they don’t have time to waste. The sense of urgency is imperative–we must form relationships with authenticity early in order to reach them. Our ability to teach them will be enhanced tremendously by our ability to connect with them first. There is simply no other priority that trumps this one! All educators should have this as their number one objective each and every day. Connect, care, and collect information about them. Use this to inspire and empower kids with confidence, knowledge, and life skills. These are the traits that will give them the ability to tackle content. As an adult, I can quickly think back on my student life of 19 years (from kindergarten through graduate school) and my mind immediately separates my teachers into two categories: those who connected with me, and those who did not. 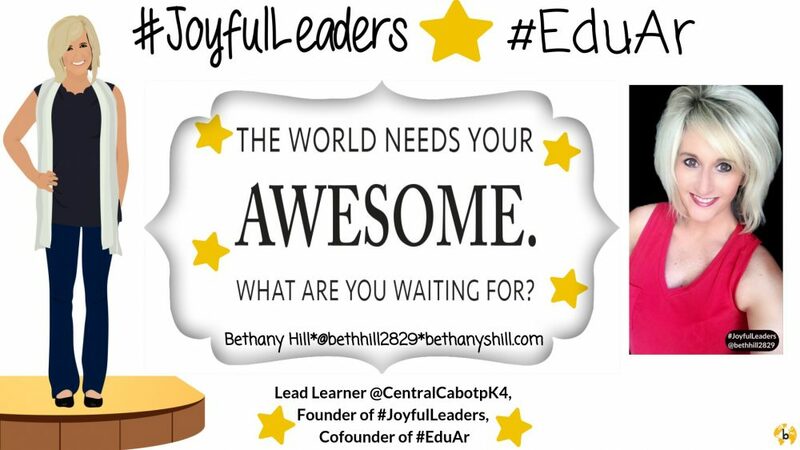 When I first began my career in Cabot, Arkansas as a first grade teacher, I made myself a promise to work diligently at the task of being a teacher that kids would remember in the “connected category”. I have never wanted to be anything less! What if all educators felt this charge each and every moment they spend with kids? I can honestly say that I have not taken advantage of every single opportunity, and I deeply regret those moments where I missed out on a chance to make a strong connection with a child. I am proud to say that those moments are few and far between, but they do hold a mass of regret in my heart. I challenge you to have little or no regrets when it comes to chances with kids. Take every opportunity, and seize every moment. Don’t get lost in the content you teach. Get lost in who you teach each and every school day. Get personal. Get connected. Get attached. It will be worth every moment of time you spend. Bethany, what a great wait to start thinking differently about how we approach teaching from a different lens. Have you ever heard the story of the circus elephant? From the time it is born it is tied to a stake with a heavy chain. No matter how hard it pulls it can not get free. The older it gets the bigger the chain. It struggles to get free but no matter what it does it can not. By the time it is full size it has been conditioned to the chain. It is mentally beat and accepts the fact it can not get free. It could simply break the chain as an adult but because of years of being exposed to negative results it simply gives up and gives in to the chain. The elephant limits itself and no longer takes a chance on getting free. By heavily relying on content and placing priority on it, we are basically chaining our students and not allowing them the freedom to express creativity, perseverance, originality, or the ability to real world problem solving. We are creating carbon copies in world that needs individuality. Now, we are not saying that content is bad. We are educators, we are to help our students make sense of the curriculum. What we are saying is that content should be a second thought. Let’s start with the foundation. Relationships! In working with the Focus 3 organization this school year and learning about the R-Factor, they stress the importance of owning your 20 square feet. Because if we own our classroom and build relationships with our students we start the process of TRUST. If we reword the Teddy Roosevelt quote for the classroom it would read…Kids don’t care how much you know until they know how much you care. The electrical impulse of the heart is 40 – 60 times stronger than the brain. It is many more times stronger than any other electrical impulse in the body. The heart’s vascular system is 60,000 miles long and can wrap around the earth twice. Different people’s (or even animal’s) heart cells, will all beat in unison in a petrie dish. Different people’s brain cells in a petrie dish will not communicate with each other and die. So, why all this data on the heart. Because the heart is what connects you to others and they can detect you heart energy. Our hearts will naturally sync with others when they are in our presence and the opposite is true. Think about it. Have you ever been in a room with someone and you thought…their energy is contagious. I feel energized just being around them. Then there is that instance where you left a room feeling drained because an individual was so negative. If we bring into our classroom positive energy from the heart we will transform the relationships we have with our students and they will in turn learn more from you. Again, content second. Lastly, we must multiply our efforts and influence others. Your vibe attracts your Tribe! If you have bought in then I dare you to not teach anything for the first three days of school. Work on heart level engaging activities. Build relationships and show students that they can trust you. Grow in understanding every aspect of what makes each student special. Think of the 3M approach. Model…what you want to see. Mentor…as others begin their journey from watching what you are doing. Multiply……by sharing your contagious energy and empowering others to embrace the #CARinitiative. CHALLENGE: We wanted to end this blog a little differently. We want to challenge you to try this for a day or start doing it as much as you can. Generate some buzz by sharing what you are doing using #CARinitiative. Tag us in your post so we can share what you are doing with our PLNs. We can’t wait to see your posts! Let’s inspire others as we challenge ourselves. This entry was posted in Edcucation, Leadership, learning environment, Relationships, school culture and tagged Education, Leadership, Relationships, school culture. Bookmark the permalink.